Mobility scooters are one of the most popular mobility vehicles used by seniors. They offer the convenience of an electric wheelchair, but usually cost less. This makes them an excellent choice for those who are able to walk for short periods of time, but with difficulty. The mobility scooter shares a number of similarities with electric wheelchairs, but the design is actually quite different. In an adult scooter, a chair sits towards the back of a base that is quite longer than most electric wheelchairs. A set of handlebars, called a tiller, extends from the front of the scooter, which allows the user to control the direction and speed of the electric scooter. It is possible to get a three wheel or four wheel mobility scooter, with four wheel mobility scooters offering better stability and weight support. Three wheeled scooters, however, have better maneuverability and usually weigh less than 4 wheel scooters. For those who are going to be using the scooter primarily indoors, 3 wheeled scooters are often a good choice, as they work well in smaller spaces. For outdoor use or if a higher weight capacity is needed, 4 wheeled scooters are almost always the best choice. There are actually a number of different mobility scooter accessories available, which can make the mobility vehicle more comfortable or more convenient. When considering accessories, it is important to differentiate between accessories that are specific to the actual model of scooter and generic accessories. Scooter specific accessories, which are designed to only work with a specific brand or model of scooter, can be more expensive and are not carried by as many dealers. Some examples of scooter specific accessories would be an automatic lifting seat, which electronically raises and lowers the scooters seat, making transfers more convenient. Generic Scooter Accessories, on the other hand, are often available much cheaper if you do a little shopping around and since they will work with many types of mobility scooters, it is not necessary to buy them from the same place you buy your scooter. Instead, it is often possible to save a great deal of money by doing some shopping around, where this is not really the case, with the price of most scooters being set by the manufacture. For example, many mobility scooter dealers will sell visibility flags that can be attached to a scooter, making it more visible in crowds or to vehicles. A visibility flag would be considered a generic accessory, because it is not designed for a specific scooter and will instead work with most models. However, you can often get a much better deal if you goto your local bike shop and buy one of their flags. Scooter bags are much the same and you really can save a great deal of money by shopping around. There are many types of scooter accessories, including oxygen holders, cane holders, bags, scooter trays, and baskets. By understanding the difference between scooter specific accessories and generic scooter accessories, you can save a great deal of money, because most dealers have a high markup on their accessories. These are the bread and butter, especially if you are getting your scooter for below MSRP. Frugal TIP: Goto your local bike shop or sports store when looking for things like side-view mirrors, visibility flags, and bags for your scooter. Often, you will save money on these types of generic scooter accessories, as well as getting it right away instead of having to pay and wait for shipping. Electric wheelchairs, which are often also called power chairs, offer the advantage of a manual wheelchair, in that they are very maneuverable. However, unlike manual wheelchairs, power chairs are powered electronically, so they can typically be operated very easily, requiring very little physical activity of the senior. A simple joystick control scheme is most popular for controlling electric wheelchairs, which allows the senior to simply push the joystick. The joystick, which is attached to the arm of the power chair, then moves the wheelchair in the direction they wish to travel. Of course, there are a number of alternate wheelchair control systems available as well, including breath controlled systems and remote controlled systems, which are often used by caretakers. The first electric wheelchairs, which were developed in the early 1950′s, were simply adapted E & J manual wheelchairs. An electric motor was attached to the manual wheelchair, which was controlled using a simple joystick control scheme, although even during the 1950′s, researchers were already coming up with alternate control schemes. One popular method was to mount something similar to a joystick near the individuals head. They could then use their face to control the electric wheelchair. Today, while some portable electric wheelchairs do use a traditional steel tubed folding wheelchair design, most look much different from a traditional manual wheelchair. Instead, an electric motor and battery is contained in the base of the wheelchair, usually covered by molded plastic. A captains chair, which, depending on the cost of the power chair, often rivals that of most office chairs, both in comfort and durability, is mounted on the base of the wheelchair. The captains chair often reclines and swivels, to facilitate comfort and make transferring into and out of the wheelchair easier. Some even include an electric lifting system to raise and lower the chair. While many power chairs share a similar design, one way they are often classified is by their wheels. 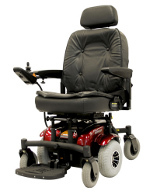 A mid-wheel power chair features one set of large wheels in the middle of the base and one set of smaller wheels on the front and back of the base. The larger wheels are what does all of the work and are powered by the electric motor. The smaller set of wheels on either side of the drive wheels, provide extra support and stability. 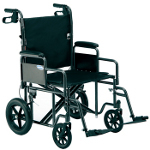 The mid-wheel electric wheelchair offers the advantage of excellent maneuverability. It can turn in much smaller spaces. However, in some cases it might not offer the same stability as a rear-wheel drive wheelchair. This is because the center of balance for a mid-wheel wheelchair is in the middle of the power chairs base. The other common type of electric power chair is the rear wheel drive wheelchair. These feature a set of rear wheels, which depending on the model might be slightly larger, and a set of front wheels, giving it four wheels in total. The rear wheels, are powered and what actually moves the power chair. The rear wheel drive wheelchair does not offer the same maneuverability that a mid-wheel power chair does, but does offer increased stability. This is because the weight of the occupant is more evenly distributed across the base, making a wider center of balance. As is the case with manual wheelchairs, power chairs, both mid-wheel and rear wheel drive models, include anti-tip casters to prevent the wheelchair from tipping over backwards. One of the major advantages that an electric wheelchair offers is that it does not require much effort to use. Simply push the joystick and the power chair will move, with many offer very small turning radius and sensitive controls. The speed is often adjustable and some models can reach speeds of over 10 miles per hour. The range of a power chair varies, but most can travel at least 5 miles without requring a recharge. Some can travel upwards of 20 or 30 miles per charge, but this often is dependent on the terrain and weight of the occupant. For example, if you decided to drive around the hills of San Fransisco, the battery would wear down much quicker than it would when used on flat land. Along the same lines, if the rider weighed 300 pounds, the battery would wear down quicker than if they weighed 150 pounds. Often, an extra battery pack is purchased for those who use the power chair continuously, as this way when one battery pack wears down, it can be removed and charged, and the fresh battery pack used. While the electric power chair can be an excellent device, especially for seniors, it is often cost prohibitive. Of the three main mobility options, manual wheelchairs, electric wheelchairs, and mobility scooters, electric wheelchairs are by far the most expensive. When compared to mobility scooters, electric wheelchairs often also have a lower range, lower top speed, and are not as well suited to rough terrain. However, for indoor use, they are usually superior to scooters. For a senior, walking for extended periods of time can often be very difficult, which is often the result of injuries or in some cases diseases, such as arthritis. Finding a way to increase accessibility and mobility is very important and often a manual wheelchair will offer the least expensive option for a senior. The wheelchair is probably the most well recognized and well known mobility aid, and its origins can be traced back many thousands of years. However, the modern wheelchair, with its steel tubed frame, two large wheels in back, and smaller wheels in front, is actually a fairly recent inventions. These manual wheelchairs, which can be found at virtually any hospital, store, or airport, are based off of the E & J wheelchair, which was first developed and refined during the 1920′s and 30′s. The E & J wheelchair, which features lightweight steel tubing and can be easily folded to make transportation easier, is still around today and serves as the basis for most manual wheelchairs. In fact, early electric wheelchairs also used the E & J design. Today there are many adaptations of the E & J wheelchair and many improvements have been made to increase durability, reduce weight, and improve comfort. For a senior, a manual wheelchair is often one of the easiest ways to make getting from point a to point b easier. However, using a manual wheelchair requires a good deal of upper body strength, so as a result, most seniors who use manual wheelchairs rely on a family, friend, or caretaker member to push the wheelchair. Due to their lightweight and lower cost, manual wheelchairs do make an excellent choice for traveling or going places, like an amusement park, where a lot of walking is required. This is of course, as long as there is someone available to operate the wheelchair. 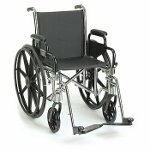 In addition to the large rear wheels and smaller front wheels, manual wheelchairs also include anti-tip casters. Ant-tip casters extend from the rear of the wheelchair, usually at least six inches from the ground. In the event that the wheelchair is tipped backwards, the anti-tip casters make contact with the ground, keeping the wheelchair from completely tipping over. If the senior is not going to be using the wheelchair at all, transport wheelchair, which are also called transfer chairs, are available as well. A transfer chair is similar to a wheelchair, however it does not feature the large rear wheels, which make it possible for the wheelchair user to roll the chair independently, but are instead designed to make it easier for a caretaker or family member to roll the wheelchair. These are often a good choice because they are typically lighter and smaller, making them easier for a caretaker to use. While manual wheelchairs or transfer chairs are often the easiest type of mobility aid to procure and are also often the most cost effective option, for a senior, they are often not the easiest type of mobility aid for a senior to use. For use around the home, it could be a good choice, as they are very maneuverable and in such a small area, it would not require too much effort to use the chair. For long distances though, using a manual wheelchair could quickly become tiring for a senior, so manual wheelchairs might not provide the best choice for a senior who lives independently.